KINK RESISTANT CABLE: Our 3/32" nylon coated speed cable is made in the USA. This cable is for indoor use. Most other ropes on the market are using PVC coated cable which wears out twice as fast. 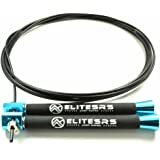 IMPROVE DOUBLE UNDERS: Designed by a champion speed jumper to improve your double under skills. 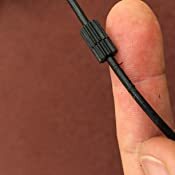 The large cable hole allows for a variety of cables to be used to meet each jumpers needs including 1/16" bare wire for competitve speed jumpers, 1/8" heavy cable for outdoor use or jumpers who like the feel of a heavier rope (purchased seperately). 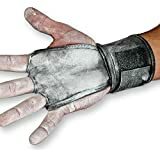 Bear KompleX 3 Hole Leather Hand Grips for Gymnastics&Crossfit,Pull-ups,Weight Lifting.WODs w, Wrist Straps.Comfort&Support-Hand Protection from Rips &Blisters. Feels like the rope turns itself. A jumper is trying to produce rotation in the handle's axle. He does this by moving the handle in a circular motion with the cable trailing behind. This puts tension on the cable creating the centripetal force that causes it to rotate around the handle. This motion permits the jumper to move her hands in more of a reciprocating (up and down) motion rather than a circular motion by implementing theories of a crank mechanism. It our belief that this causes less fatigue, can produce faster rotation, and allows the jumper to maintain a more consistent speed (assuming that maintaining a consistent pace in a reciprocating motion (like drumming) is easier than while in a circular motion). The advantage to having two bearings is that it handles the axial load much more efficiently. With 1 bearing, there is the addition of detrimental axial torque. The added axial torque on the bearing will cause it to wear out faster, and adds friction so it spins less freely. Radial bearings are not designed with axial torque in mind. It is assumed that they will take only axial load and/or thrust load. Overall, the design causes the handle to be very rigid and feel 'solid' in your hand. 5.0 out of 5 starsProbably best rope I've used. 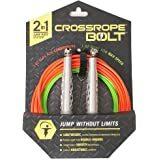 I've been jump roping for about a year now and I've purchased a few ropes and logged several dozen hours on each of them except the Surge rope--I just bought that one. I thought I'd give you my impression about each of them for your benefit. Since I'll compare several, I'm not going to be too thorough. Mostly, I'll write down my bottom lines on each rope with only a little bit of elaboration. If you want a basic rope where speed isn't a concern, this is the one for you. This rope is a good rope, I think, to learn on because you can practice crossovers as well as double unders. (All of the other ropes really aren't designed for crossovers). 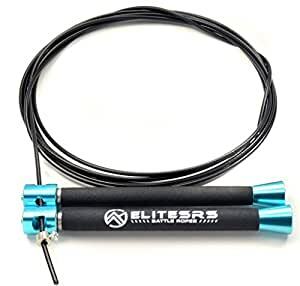 Note, though, since it's not really a fast rope, you'll have to put in a lot more effort to do double unders with this rope than any of the others on this list. Again, though, for learning this is a much better rope than most on the market and for $9, it's a good deal. I had high expectations for this rope. If you don't know who Buddy Lee is, youtube him. 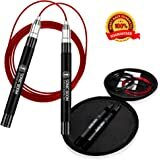 His skill and the high price tag may indicate that this is the holy grail of jump rope. It isn't. To be clear, it's a good rope but it's not a great rope. Now I want to be clear that my preference is for fast ropes and with a name like "Aero Speed," you would think it's incredibly fast. It isn't. Perhaps only slightly faster than the aforementioned freestyle rope and certainly not an extra $30 worth. Plus, you have to keep this rope well oiled or it squeaks. The best thing about this rope are the short handles that, I believe, are made from aluminum. This is a good rope. Probably the best in a performance/price ratio. The handles feel slightly heavier than the Quad Speed rope and they also feel like there's some kind of gyroscope thingie inside it. Further, the length of the rope is more easily adjustable than that of the Quad Speed rope. The rope is plenty fast but slightly less so than the Quad Speed. Another plus of this is that the rope feels like it will last longer than the Quad Speed. My impression is that this rope is less expensive, will last longer, feels good in your hands but is not as fas as the Quad Speed. I love this rope but it feels cheap. Perhaps, though, this is precisely the reason why it is so fast--less heft. It broke on me, though, after I started to really focus on double unders. 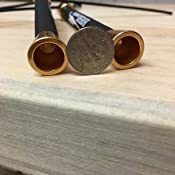 And though I mentioned that this rope is a bit more difficult to adjust the length of, that's only because it comes with a little washer type thingie that you're supposed to hammer in place as a stopper and once it's hammered, you can't un-hammer it. I never used that stopper so you're left with a regular screw that keeps the handle secured to the rope. 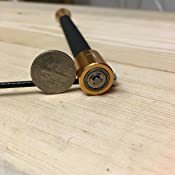 If that screw becomes loose (and it will with regular use of the rope), the wire rope will fly out even though the handles are still firmly in your hand. This doesn't happen too often though. In the end, this is a great rope. In terms of looks, it is just as attractive as the Aero Speed. 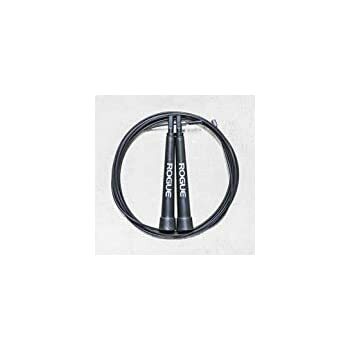 The handle on the Quad Speed rope is plastic and flared out--like a tiny cone that is gripped with your thumb and forefinger at the narrowest end. 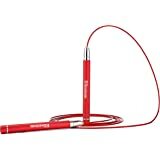 This Surge rope is basically uniformly shaped and slightly thicker than a #2 pencil. This shape means that you're going to have to apply a firmer grip relative to the grip on the Quad Speed rope. At the same time, I don't see this as a big deal. My guess is that if they flared it out like the Quad Speed, it would add weight to the handles. So, personally, I'm willing to make that trade-off. In terms of speed, I would say this and the Quad Speed are the fastest of the bunch--perhaps a slight edge in speed to this Surge rope. Admittedly, I've only used this rope for about 1 hour but it feels as though it will last longer than the Quad Speed. Giving this a 4/5 star rating because the rope hurts when it hits you is silly. 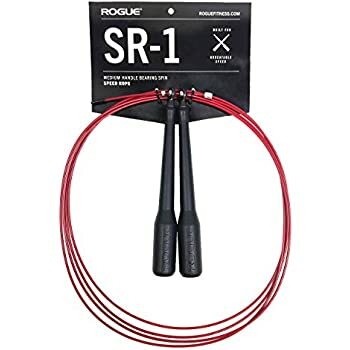 In the end, my recommendation is that you buy this Surge rope if you're intending to use the rope primarily for speed and double/triple unders. 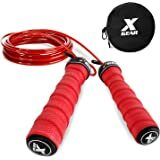 The Quad Speed rope is also a very good rope but I'd give a slight edge to the Surge. I could have been more thorough with this review but it's already pretty lengthy and I don't want to spend more time on it. :/ If you have any questions/comments, I'll try to respond in a timely manner. Works great when it works, I had this for about 1 year now and it was fine when I first got it. 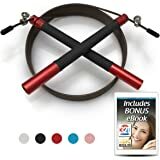 After using it maybe twice a month and always in a separate compartment in my gym bag the left handle doesn't spin smooth any more, seems to spin off because the gap from the spinner and the rubber has a larger gap. So from light use the parts fell apart, I also read some other reviews mentioning the same problem but theirs were bent, which mine is not. 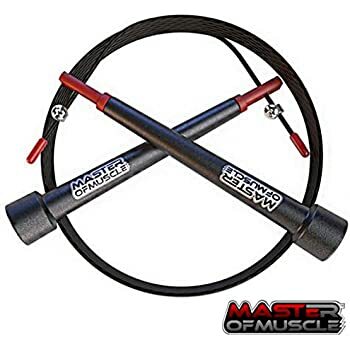 I definitely would not recommend getting one of these, back to the old school Rx ropes. 5.0 out of 5 starsLike Buttah! I've only had this for a week or so and I've used it several times since receiving it, so this review is more of a first impression. 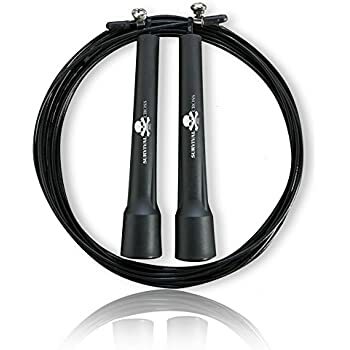 Straight out of the gate, there is a lot to love about this jump rope. It feels really good in your hands. It seems very well constructed, and there is no feeling of "cheapness," very solid. The handles have a sort of textured feel, combined with the flared-out metallic ends there's almost no chance you're losing your grip no matter how sweaty your hands get. The rope is threaded through the handles off-center, because physics I suppose. As a result, the handles are labeled "L" and "R" so you're sure of which handle you're supposed to be holding in which hand. 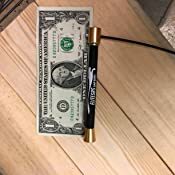 I don't know if that makes achieving double-unders easier or not. Regardless, this rope spins so smoothly. Like, satisfyingly smooth. That's due to what I previously mentioned about the construction of the handles. This is a great buy so far! 5.0 out of 5 starsFantastic, stylish, well machines handles. Worth every penny. 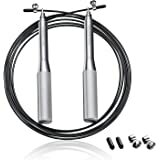 Fantastic, stylish speed rope. Worth more than you pay. Tall people take note: I'm 6'4 and an efficient single/double under jumper and this rope at its longest is just right, maybe an inch longer than needed. If you are taller you'll need a longer rope. These handles though... Legit. Well machined and designed. The action is smooth; pay attention to the left and right indicators on the handle as the spin efficiency drops if they are in the wrong hand. Love the texture on the handles, and the slight turnout at the base of the handle. I have no problem holding onto this thing at all and I have big hands. My double under efficiency has definitely improved with the consistent spin action on this rope. Tempted to take off a star because this awesome product has a really gaudy brand name stamped on the handle, but hey, America. 5.0 out of 5 starsVery Unforgiving! 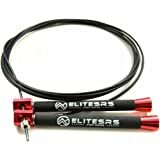 This is the fastest speed rope I have ever used, hands down. 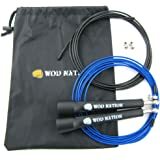 If double unders are your thing then this is your rope. Crossfitters dream rope! One thing to remember is that this rope is a steel cable and when you hit yourself you WILL feel it! All in all I am very pleased with this purchase. Very well built and it feels like a quality product. 5.0 out of 5 starsExcellent. Great rotation. 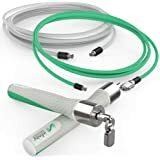 Very interesting jump rope. The handles are super light.so light you can hold them with 2 fingers. Thumb and index. But, the rotation is so fluid. I bought a 10$ jump rope before this one. This one I give a 10/10. The "adjustable stoppers" are kinda annoying, but very strong. Very happy. The cable is standard and coated. But the bearings must be different than standard bearings, it's really really fluid. I'm technically a beginner, but can tell the difference. 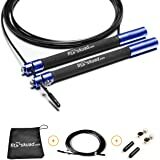 I have been using gym ropes and finally bought my own a few months ago. I wasn't sure where my double-unders went, but it was clear I no longer had them. A couple of people were talking about how this is the rope I should get. I thought, "no way, that won't help me". Wrong. I picked it up, took two swings, and bam, double infers back. It's a super-light and speedy rope. 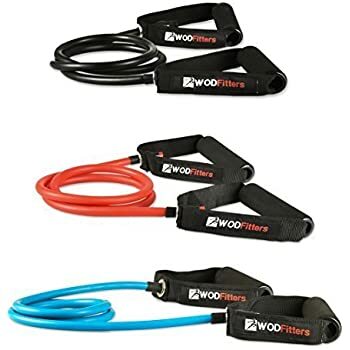 Perfect for someone who either needs an easy rope to work on double unders, or someone who needs to be able to whip them out quickly during a WOD. In other words... this rope is for everybody. Don't think. Just buy it. Now.